Everyone is disappointing the more you know them. By turns comic and poignant, the maze of love, and of the memory of love, and the idiosyncratic forms that maze takes, has been a motif of the writer Charlie Kaufman’s recent work. And yet the maze of SYNECDOCHE, NEW YORK – in contrast to his previous doubling rabbit-holes – is neither internal, nor scrambled through; rather it is a large-scale theatre, a simulacrum of the city of New York, where director Caden Cotard (Phillip Seymour Hoffman) meticulously puts on, observes, and so re-experiences the daily troubles and past disappointments in his relationships with his wives and lovers. That the protagonist is an artist considering his time with the women around him may be a nod to the familiar – but it is in the effect of this life-long, theatrical, melancholic project that the film becomes a remarkable and ambitious variation in Kaufman’s characteristically unique design. From the opening of the film, Cotard is, as his name suggests, preoccupied with the approach of death and the disintegration of his body, which only seems to widen the tense distance between himself and his wife. He directs a successful production of Death of a Salesman, and is subsequently awarded a MacArthur Fellowship that gives him the funds to create his immense life-theatre in a disused airplane hangar. This time of achievement in his professional life is weighted by his increasingly failing health (an unending anxiety seems to surface in pustules, disturbing shakes, problems in bed), and his complex personal life, marked by absence and regret and obsession, which in turn, Escher-like, becomes material for his grand play. Kaufman has always drawn skewed perspective brilliantly, particularly in highlighting the difference in perception within relationships, and he continues this trick in SYNECDOCHE. When Cotard’s first wife Adele (Catherine Keener), a painter, declines an invitation to attend a performance of one of her husband’s plays because she must spend time packing up her canvases for an exhibition abroad, there is a hilarious cut to a shot of her canvases in their boxes – she paints on the most miniscule of scales and the crates she uses resemble matchboxes she could pack in a few minutes. Similarly, when Cotard discovers, to his horror, that his daughter from his first marriage has become a tattooed celebrity at the age of ten, his second wife Claire (Michelle Williams) exclaims that everyone has tattoos and turns her back to lift up her shirt revealing an enormous, monstrous tattoo of her own – which Cotard then denies having ever seen. Keener and Williams are faultless in these roles, as the rest of the cast generally tend to be whenever they are on screen. That cast includes Samantha Morton; Jennifer Jason Leigh; Hope Davis; Emily Watson; Dianne Weist; and it feels important to name the soaring ensemble here as they are each gone too swiftly. But that, achingly, is the nature of the piece. As the play comes to its end, so Kaufman’s questions become plain: where does love go? Where does life go? Their ethereal conclusion is one of the many ways this film rewards watching and, of course, re-watching. 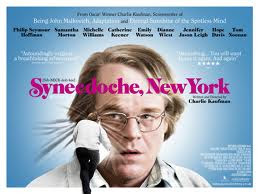 SYNECDOCHE, NEW YORK played Cannes (where it was beaten to the Palme D'Or by GOMORRAH), Toronto, Chicago and London 2008. It won the award for Best First Feature and the Robert Altman Award at the Independent Spirit Awards in 2009. It went on limited release in 2008 and 2009, and is now available to rent and own.